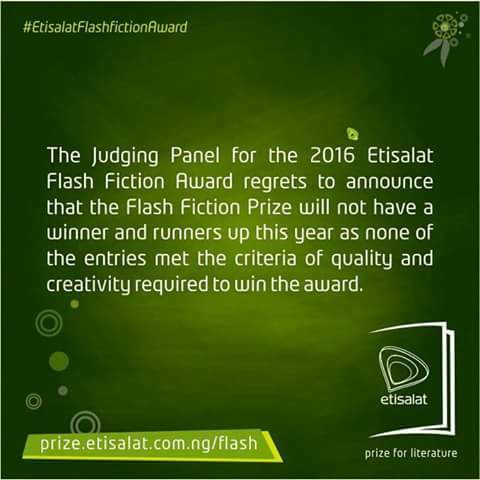 Etisalat receives knocks for failing to award the 2016 Etisalat Flash Fiction Prize. 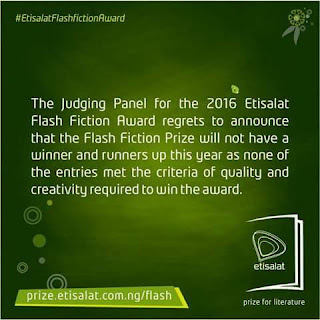 Nurdin Busari the CEO of AMAB Books Ltd has penned an open letter to Etisalat, organisers of the Etisalat Flash Fiction Prize, expressing his disappointment with the decision of the company not to award the prize for 2016. In a tweet early this morning, the Prize's judging panel announced that it was unable to name a winner and runners up as expected because "none of the entries met the criteria of quality and creativity required to win the award"
However, Mr. Busari would not take that excuse from the panel and took to his Facebook timeline to lash at the the Telecomunications Company for performing poorly in its handling of the contest in spite of its huge human and material resources that guarantees it organising a first class contest. Read his open leter below. Thank you for building the structure of a literary contest upon the foundation of popularity show-off. How else do you seek for the best when the best entries had been sieved off through their inability to secure votes from the masses? Your announcement that 'none of the entries met the criteria of quality and creativity required to win the award' is an insult to all, as you failed to walk the credible path of getting the so-called quality and creativity. It is disappointing that with all the huge human and material resources at your disposal you can end up performing this woeful. You can do better and you should! The jury of the 2016 edition of the Etisalat Flash Fiction includes Abubakar Adam Ibrahim (Nigeria), Ndinda Kioko (Kenya), Odafe Atogun (Nigeria) and Tendai Huchu (Zimbabwe). The winner was to get 1,000 Pounds cash prize and an High end device while 2 runners up were to get 500 Pounds and High end device each. The top 50 stories were also to be published in an e-book.